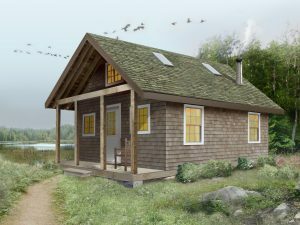 Q: How should I build the first small building on my 15 acre country property? I don’t have a lot of experience, but I’m thinking of completing a stackwall and timber frame structure measuring 16×24 feet this summer, then something larger next year. A: There are three things to understand about building. First, when you don’t have experience, it’s much more difficult and time consuming than it looks. Second, the forces of wind and weather deteriorate things faster than seems reasonable unless you take definite steps to prevent it. And third, building a scale model before you build the real thing is a huge help. Thirty years ago I set out to pursue the same dream you have. I bought property in the country on Manitoulin Island, Canada, with the dream to build a house using my own hands and materials from my land. This dream has succeeded for me, though I’ve learned hard lessons along the way. Many of these lessons have to do with construction. I know now that building directly with raw materials, as you propose, is much, much more difficult and time consuming than building with more modern methods. I still build with timbers and raw stone that I collect myself, and you should, too. But since you’re starting out and in need of a good building to stay in sooner rather than later, I’d recommend you use conventional framing methods for this first building. You’ll find this challenging enough, and you can still make a very beautiful building that has all the appeal of the stackwall and timber structure you envision. When you’ve gained more experience building in simpler ways, and have a comfortable place to live year-round, then you can tackle stackwall, timber framing, stonework log work and any of the other methods that people like us feel thrilled about. What I’m telling about here is the same approach I took with my son, Robert, when he wanted to build a small place of his own. That’s him to the right, with his wife, Edyta. We designed a 16 x 25-foot cabin framed in conventional ways but made to look and feel old and authentic. It’s funny to say, but there are now dozens of buildings around the world just like Robert’s. When I saw how popular this whole idea of small homes has become, I had our design made into detailed plans and an instruction course. People from the US, Europe, and the Caribbean have enrolled, built their own cabins and sent me photos. One of the main keys to success is the quality of tools you acquire. Don’t be afraid to invest heavily in professional-grade tools. It sounds like you’ll have a lifelong relationship with your dream and your land. In know from experience that this is a wonderful thing. I strongly recommend a life of building and self reliance for anyone with the kind of dreams you have.